FORT WORTH, Texas (Oct. 17, 2017) – For the second time in his career, Ohio State senior J.T. 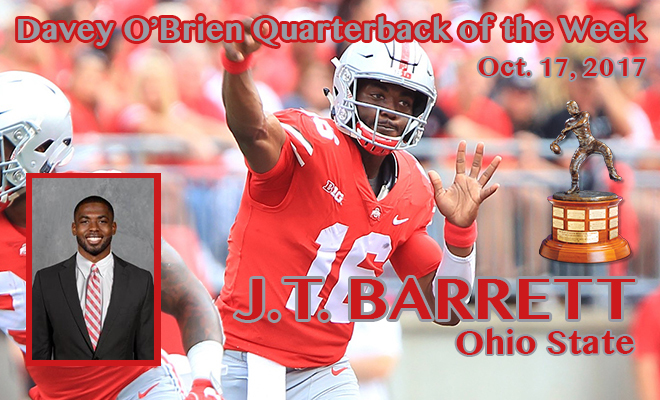 Barrett has been selected the Davey O’Brien National Quarterback of the Week. He was previously honored on Oct. 18, 2016. Barrett tied his own school record by accounting for seven touchdowns (five passing, two rushing) in just over three quarters of action in a 56-14 road win over Nebraska. Barrett had just six incompletions on the day, completing 27-of-33 attempts for 325 yards. In addition, he rushed 10 times for 48 yards, giving him 373 yards of total offense. The native of Wichita Falls, Texas, currently leads the nation in points responsible for (158) and is tied for first with 21 touchdown passes. Barrett ranks fourth in the country in passing efficiency (173.8) and also is among the NCAA’s best in total offense (13th, 313.9), passing yards (14th, 1,838) and completion percentage (15th, .667). In 207 attempts, he has thrown just one interception on the year. The two-time Davey O’Brien National Quarterback Award semifinalist (2014, 2016) was also named the Big Ten Conference Offensive Player of the Week. This marked the second time this year that Barrett appeared on the Davey O’Brien Great 8 list (Week 4). 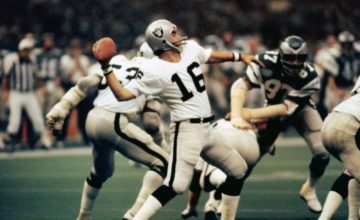 The other “Great 8” quarterbacks in week seven were: Syracuse’s Eric Dungey, Mason Fine of North Texas, West Virginia’s Will Grier, Conner Manning of Georgia State, Ole Miss’ Shea Patterson, Khalil Tate of Arizona and Air Force’s Arion Worthman. 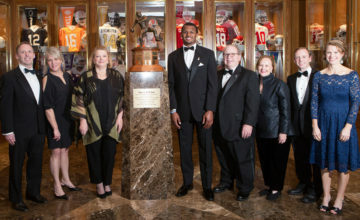 Since its founding in 1977, the Davey O’Brien Foundation has distributed more than $1 million in scholarships and university grants to help high school and college athletes transform leadership on the field into leadership in life. 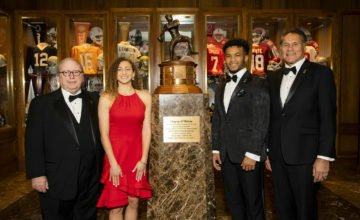 The Davey O’Brien National Quarterback Award winner will be announced on Dec. 7 during ESPN’s The Home Depot College Football Awards. The winner is not required to have won a weekly award during the season. A list of 16 semifinalists will be announced on Nov. 7, while the three finalists will be named on Nov. 21. The Davey O’Brien Fan Vote, now in its 11th year, gives fans a chance to play a role in determining the award winner. Visit VoteOBrien.org daily to vote.